Northern Lights Technique | Stampers With Altitude!!! Hi! I wanted to share this card. Normally, I NEVER post club projects. I feel like these projects are especially created and shouldn’t be posted. Well, I am making an exception this time. This technique was spotted by someone in our stamping team at Convention. Then, it went viral in our group and everyone was posting their version of it. This isn’t my “original version” of it either. I made this one for a friend. While another demonstrator outside of our group has posted a video on how it’s done, I wanted to add my two cents to this. 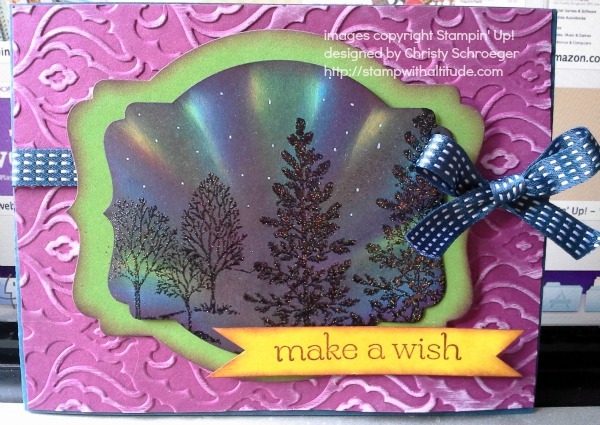 I changed a couple of the colors she used… then, I stamped my trees in VersaMark. Then I mixed Iridescent Ice and Black Embossing powder and heated it up. I think it makes the trees not only pop more but sparkle to boot! I also used the new Chalk Marker to make the stars! What do you think?? Updated September 4th, 2013! Guess what?? I made a video! 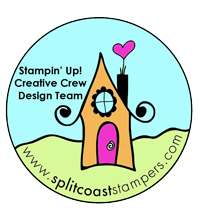 Love your card and would love to find out more on this technique. I would love to see the Northern Lights in person!! It’s on my bucket list. Hmm. Perhaps, I should post a video of my own on it? The northern lights are stunning to witness. I lived in Minot, ND for 4 years and got to see them often! I love this technique and especially your version. I watched the tutorial on Youtube, and I didn”t like the colors she used. Would you be willing to do your own tutorial? I would love to see it. Yes, Louise, I would be willing! I am going to work on a video this week! I will be working on one soon!